Since the launch of the first iPhone in 2007, eleven generations of iPhone models have been released by Apple Inc. The sale of this high-end smartphone has also increased substantially since its initial period. Today, iPhone acquires over 20% of the cellphone market share worldwide, which is a big share indeed. Besides the advanced features of the iPhone, Apple’s ‘App Store’ has greatly contributed to increase the popularity of the iPhone. A large number of useful and entertaining applications classified under different categories are quite popular among the iPhone users. Many large and medium organizations are investing huge amounts into custom iPhone application development, owing to the great demand for such apps in the market. They are looking for expert iPhone app developers to materialize their plans and achieve production targets. These companies are not hesitant to extend lucrative offers to deserving candidates. Nowadays, professional experience and practical knowledge of the domain is valued much more by employers than mere academic qualification. Many surveys have revealed that employers prefer more the candidates having a professional certification or experience in addition to the university degree. This is because working experience or a professional certification is a proof of your practical knowledge and skills. 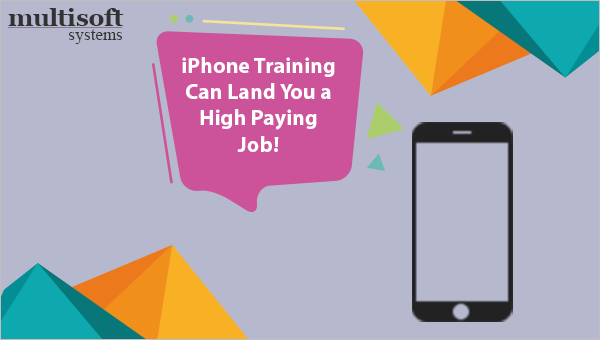 So, the best way to make a career in the field of iPhone app development is to pursue professional iPhone training courses from a good institution. The things that you may consider to assess the credibility and value of a training institution are: seeing information regarding the track record of the institution; reading student reviews; going through their website (see information regarding the course you are interested in, plus the list of other courses offered by the institution); taking a trial session, etc.